A sickness can change your life, at any point in time. There are some disorders, which will haunt you for the rest of your life. This is true when it comes to sleeping complications. There are many different types of over-the-counter medications, which can help provide you with relief. ZzzQuil is definitely one of these drugs and it is commonly used to provide the user with a restful night’s sleep. Does it work and which version is the best? You will find out below. Before moving forward, you should take the time to learn about ZzzQuil. This medication is an OTC, which can be purchased, without a prescription. This medication is manufactured by Vicks. This company has been in the industry for an extensive period of time and they’re best known for their cold and sinus medications. 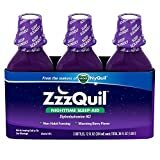 NightQuil is undoubtedly one of their most reliable products. This is a non-habit forming sleep-aid, which can help you fall to sleep, with less difficulty. Before taking this medication, you should realize that a lot of people will initially question its effectiveness. This is a terrible mistake! The truth of the matter is that NightQuil / ZzzQuil might be new to the market, but it has already been proven to be incredibly effective. The majority of users, who have experimented with NightQuil, have been able to get the results that they desire. If you have difficulty sleeping at night, you may very well want to purchase and begin utilizing this medication. Now, you should realize that Night/ZzzQuil is available in a variety of different forms. Those that like consuming pills will be happy to know that it is available in caps. Of course, it is also available in a liquid version. The liquid variety is available in several different flavors, including vanilla cherry, warming berry and mango berry. Despite the names, none of the medications are delicious. The majority of individuals will agree that the taste is somewhat hideous. Before using this medication, you should take the time to look at the side effects listed below. Take note that these side effects are generally very rare. As long as you use the medication as instructed, you shouldn’t experience any of them at all. 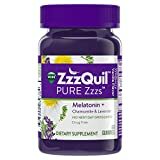 Below, you will be able to find some ZzzQuil reviews to help you find the best solution to your sleeping problem. 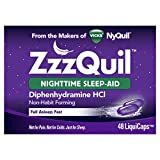 Diphenhydramine HCL is the active ingredient in ZzzQuil. This substance is often used in cold and flu remedies to help the individual rest, so their body has time to heal. This ingredient does cause drowsiness and should only be taken as recommended by the medical experts. ZzzQuil is very effective in helping the insomnia sufferer fall to asleep faster. It is important to allow yourself at least eight hours, so you can get a full night’s sleep. If you take this sleep aid and only have four-six hours to sleep, you may potentially experience periods of drowsiness throughout the following day. If you are searching for a safer alternative to prescription medications, you should consider ZzzQuil. It is not habit forming and will not cause extreme drowsiness the next day, so you can continue your normal routine without issue. There is nothing worse than having to force down a gulp of medication that tastes horrendous. Well, that will not be an issue with ZzzQuil, because it consists of a berry flavoring that is very desirable. It also offers a warming sensation that will calm the nerves, so you can get a great night’s sleep. You should not combine this medication with any other medication that contains diphenhydramine. This will increase the side effects and risk of overdose. It is recommended to only take ZzzQuil at nighttime, before going to bed. The recommended dose is 30 milliliters every 24-hours. It is also not suitable for children under the age of 12 years old, individuals with glaucoma, women who pregnant, or trying to get pregnant. ZzzQuil Nighttime Sleep-Aid is highly effective in treating the occasional bout of insomnia.